the letter 'a' is pronounced like 'u' of but, cut, shut etc. in a word, the trailing sound of 'a' causes a lot of confusion in modern times. if it is not stressed enough, it sounds like a consonant without the vowel, like many english words put, cut, but etc. the lack of stress on trailing 't' is what would be called a 'halant' or vowel-less consonant sound. when it is stressed, usually it ends up sounding like 'aa'. this confusion gives rise to errors of saying shiva as shivaa (pArvatI), brahma (brahman, the supreme unmanifest) as brahmaa (the creator, the manifest), drupada (the king) as drupadaa (his daughter), kRiShNa (the cowherd) as kRiShNaa (draupadI). gaNesha is pronounced as gaNeshaa. the 'sha' and 'ga' have exactly same vowel pronunciation, but mostly in english it is pronounced as 'ga' and 'shaa'. avoid such errors. 'a' is also a word in itself. the word 'a' (just the vowel), implies viShNu. thus praNava (om) is trifold. as a prefix to adjectives, a- has 6 different shades of meaning. it works like the in-, im-, un- prefix of latin. apart from one exception, the an- prefix also forms from 'a' only. 3. different. e.g. a-paTa - not paTa (cloth) but something else. 5. bad, unapproved. e.g. a-kAla = not appropriate time. a-kArya = inappropriate work/deed. 6. opposite. e.g. a-satya = opposite of truth. a-dharma = opposite of dharma, wrong doing, injustice. A little confused here. 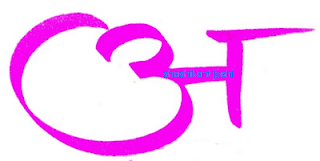 Should the first letter read a-kAro, the second viShNur etc. Please advise..
technically yes. 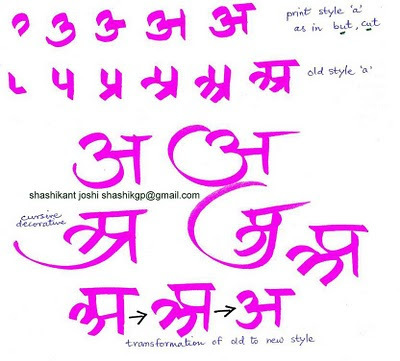 but in the roman script, i removed the sandhi changes to give the base words. 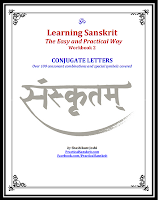 without sandhi, the original would read as is given in the roman. My apologies again but what would be the correct pronunciation if I am reading. this is the proper verse. in general, if sandhi is broken up, it can lead to extra mAtrA-s and mess up the verse structure. hence the proper verse, when read has to be read this way only. 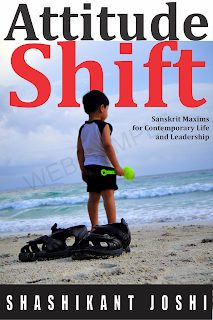 the sandhi breakup is given only for ease of understanding the individual words. try reading with the sandhi broken, i.e. with all the visarga-s, and you will see the flow breaks. hence, in sandhi the visarga goes away and the flow is smoothened a bit! Thanks brother. You are such a boon to us new learners. Acabo de empezar con las letras. Tanto las lecciones como el video son muy didacticos. Thank you so very much for sharing your knowledge. I'm just a beginner yoga student trying to learn more about the history of yoga and also to be able to read, write and chant Sanskrit. Your site is incredibly helpful!!!! Thank you again. Namaste.